Low-dose rate (LDR) prostate brachytherapy is a highly efficacious and cost-effective treatment with a very favorable side effect profile and has a role in the treatment paradigm of low-, intermediate-, and high-risk prostate cancers. Brachytherapy is typically an outpatient procedure where tiny radioactive “seeds” are implanted in the prostate to eradicate the cancer right where it has grown. Brachytherapy has a long and proven track record with data demonstrating it to be extremely effective when used alone in low and favorable intermediate-risk prostate cancer. Brachytherapy also shows significantly higher rates of cancer control and tumor eradication in the higher-risk setting when used in combination with external beam radiation therapy (EBRT) as compared to surgery or EBRT alone. Despite its efficacy, brachytherapy utilization rates are declining secondary to competing treatment options, to include a shift to active surveillance. 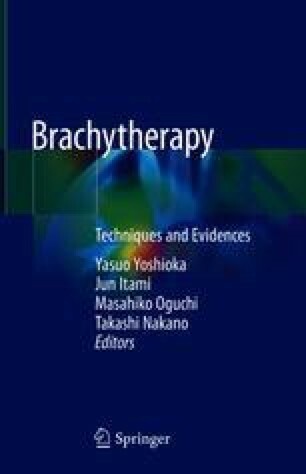 With prostate cancer diagnosis on the rise, and prospective and randomized trials showing brachytherapy’s superior efficacy over other modalities such as radical prostatectomy and EBRT, it is important to put corrective actions in place to ensure that brachytherapy is available to patients across the globe. Howlader N, Noone AM, Krapcho M, Miller D, Bishop K, Kosary CL, Yu M, Ruhl J, Tatalovich Z, Mariotto A, Lewis DR, Chen HS, Feuer EJ, Cronin KA (eds). SEER Cancer Statistics Review, 1975-2014, National Cancer Institute. Bethesda, MD, http://seer.cancer.gov/csr/1975_2014/, based on November 2016 SEER data submission, posted to the SEER web site, April 2017.